His mother Jenny, recently divorced, has left behind a controlling mother and an abusive husband who thought more of his buddies and the bottle than being a father or husband. Is Jenny’s ex really the distraught parent he seems or is he the culprit? How is Mommy going to find me? Maybe he lied about that, too. The story starts out in the boy’s POV, and though he is a little precocious for five-almost-six, he is still well-developed and three dimensional. All the characters are extremely well done. The thing I liked best about the book is the ring of truth it has. It feels so authentic it makes me wonder if Ms. Irwin hasn’t been through exactly the same thing herself. From the moment she discovers that Clayton is gone, Jenny’s life is turned upside down. The cops are called in—but how much can they really do—and Jenny and her ex become the prime suspects, at least for a time. Meanwhile as the cops investigate and the search for the boy goes on, Jenny’s hope for his safe recovery diminishes as her terror at his fate grow. My heart went out to her. As it did to Clayton and to Steve. The ex and Jenny’s mother, not so much. In fact, I wanted to brain the both of them. And it takes a good writer to get me that involved in the characters. This was an absolutely absorbing book. When a child goes missing from his safe back garden whilst playing in his sand pit and his mom just rustling up some sandwiches for lunch, where did he go? Although of course based on Clayton missing, it also has other avenues of a story in it which I found really good. it wasn't just about Clayton, other people who were involved and the quiet place she moved to, it all evolved superbly. I'm not one to give out too many spoilers, read the blurb. This had me engrossed from beginning to end, I would definitely read more of her books, actually, I do have more!!! The author was new to me, I chose this to read when a kind author wanted to buy me a book just for my pleasure as I read a lot, but mostly for helping other authors with reviews. It was a lovely gesture which I reluctantly accepted as I do what I do for no gain. I'm glad I chose this book to read, thoroughly superbly written and thought out plots by this author. Whatever you do, do NOT miss reading a Bev Irwin book! I received Missing Clayton for my review. This is the 2nd book of Ms Irwin's I have read and I cannot wait to read another one! Missing Clayton kept me spellbound and I couldn't wait to find out what happened! After I finished I was sad that I didn't have more! This book, as with Ms Irwin's other books will keep you on your toes throughout the entire book! Her writing style pulls you into the book where you can feel this mother's pain and fear in searching for her son. I don't want to give a spoiler on this book, so Go, Get this book NOW and read it! While you are at it get another Bev Irwin book! This book along with her others are heading for best sellers! I can also see movies in the future! Keep up the wonderful reads, Bev! Bev brings the most terrifying situations to life with compassion and thoroughness. You could feel a mother's angst and terror over losing her son. How often do we see an Amber alert and think - oh how terrible - but not realizing how the family feels. Her characters are so well written you think you know them. I cannot imagine how losing a child would feel but learned an inkling by reading this book. As with her other books this was very well written, fast paced and easy to read. I would highly recommend. Missing Clayton by Bev Irving is a thrilling story about a five year old boy taken from his backyard in the middle of day. We are taken for a emotional as well as nails biting ride along with his mother, Jenny who is caught up in the whirlwind of hell. She will stop at nothing to find her boy dead or alive. With the boy's disappearance the entire town (a small community) seems to relive the horrors of their own and everyone knows something, but is afraid to say it. Media has a field day, bringing out the worst of Jenny's life, accusing her of harming her own child then claiming he's gone missing. Police officer on the power trip harasses the usual suspect, Jenny's neighbour Steve, and her one light point and rock to lean on. The reader also gets to see the horror little Clayton is experiencing. And while his kidnapper has no intention to really hurt him as long as he is co-operating, one can't help but shudder in fear. Bev Irvin has managed to capture the mentality of a small town in the middle of the farming county so well, every character jumps off the page and becomes alive, even the bloodhound Missy. I highly recommend this book to all and especially parents and grandparents. 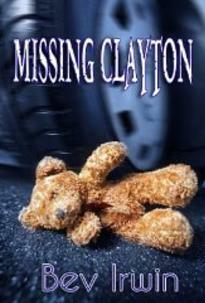 Missing Clayton is about a child abduction and the related trauma. I had a sort of love/hate relationship with this one as it was just too realistically horrible and painful experiencing so much through the mother's and the son's eyes. However, this does show how well written the book is. Overall, it is a very vivid, fast past ride! page-turner that will appeal to lovers of women's fiction everywhere.